Q: What is insurance fraud? A: Insurance fraud occurs when individuals deceive an insurance company, agent or other person to try to obtain money to which they are not entitled. It happens when someone puts false information on an insurance application and when false or misleading information is given or important information is omitted in an insurance transaction or claim. Insurance fraud is committed by individuals from all walks of life. Nationwide, State Insurance Fraud Divisions have prosecuted doctors, lawyers, chiropractors, car salesmen, insurance agents and other persons in positions of trust. Also, anyone who seeks to benefit from insurance through making inflated or false claims of loss or injury. Insurance fraud can be "hard" or "soft." Q: What is the difference between insurance fraud and an insurance regulation violation? A: Insurance fraud is a criminal act and a violation of insurance regulations is an administrative matter that may affect licensure. 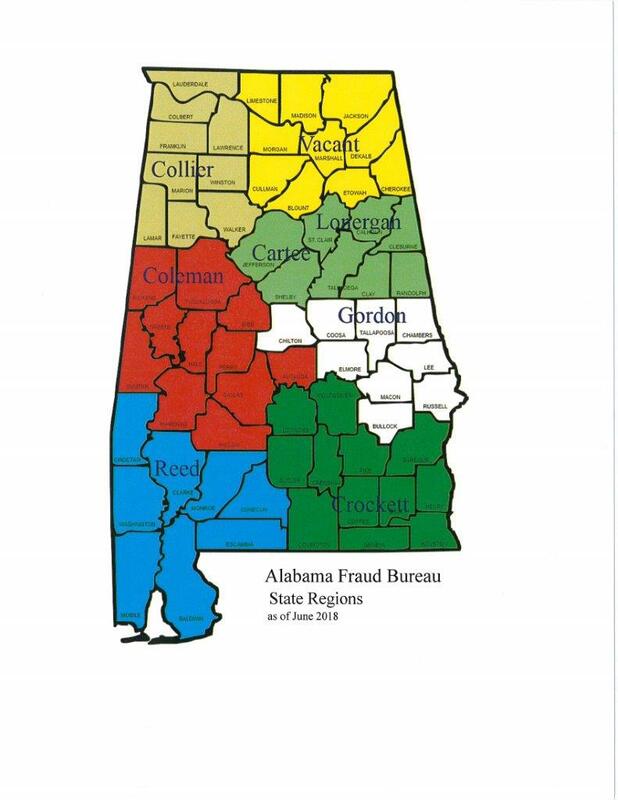 Q: Who enforces insurance fraud in Alabama? A: Enforcement of the insurance fraud laws is like any other law. The criminal act is investigated by a law enforcement agency and presented to a District Attorney for presentation in the criminal courts. Q: Can any law enforcement agency enforce insurance fraud? A: The main enforcement of this law was given to the Department of Insurance and the Insurance Fraud Unit created to investigate the crime. The law does not prohibit any law enforcement agency from investigating the alleged crime and presenting the results of the investigation to the District Attorney. Q: How do I report fraud? A: Click the link to the right side of the page that says "Report Suspected Fraud" and fill out as much information as possible. Q: What information do citizens need to report? Q: What information do insurance companies need to report? Identification of the suspects(s) such as name, DOB, address, phone, email, etc. Q: What happens to my report after I submit it? A: With all reports of suspected fraud, the information is screened with the potential to have a positive outcome if assigned to a criminal investigator. A positive outcome is defined as, but not limited to, the ability to confirm that fraud did occur, the ability to identify those responsible and the likelihood that a criminal prosecutor will accept the case for prosecution, based on the known available follow up information. Every attempt is made to contact the reporting person within 5 days of receiving the information. During that contact (via mail, email, or phone), the reporting person is informed as to whether or not the case can be assigned and if so, who the investigator will be. If the information is not determined to be assignable, a formal letter will be sent as to the reason for the status. The assigned investigator will contact the reporting person and/or victim within the first week and give an explanation of what to expect from the investigation, timeline, and what is needed from them as witnesses or victims, etc. The timeline of progress for every investigation includes a 30-60-90 supervisorial review. Due to the nature of insurance fraud, many investigations take months, in rare cases years, but the intent of the timeline is to keep the investigation moving forward and to keep the victims and/ or witnesses updated. Q: If I have reported fraud in the past, how can I find out the status of my complaint? A: To find the status of a case, contact the agency who is investigating the case. Q: What is the statute of limitations on insurance fraud? A: The statute of limitations on the crime of insurance fraud is two years from date of discovery of the fraud.